As your business evolves, there comes a point where the business applications that have supported your growth start to restrict your future potential. What used to be your greatest strength becomes your weakness with a myriad of point solutions for financials, manufacturing, stock management, distribution, eCommerce and CRM making it difficult to seamlessly link processes and to get a single view let alone control of business performance. We help our customers to unlock their true potential by consolidating business management with SAP Enterprise Resource Planning Software that restores this visibility, control and agility. We specialise in doing this for small and mid-sized businesses. SAP Business One is SAP Enterprise Resource Management Software specifically designed for the small to mid-sized business. We believe that it provides our customers with the best of both worlds. A comprehensive accounting and business management solution that is both affordable and easily configurable to the specific needs of your business. Codestone was one of SAP’s first Business One Partners, and we have created one of the largest dedicated SAP Business One practices in the UK. We now support over 4,500 end-users across over 300 UK sites and a further 100 international sites. SAP Business ByDesign provides mid-sized businesses with between 50 and 1,000 employees with comprehensive and fully scalable SAP Enterprise Resource Planning Software delivered as a managed service from the Cloud. For our customers SAP Business ByDesign provides them with a single application that unites all of their key business functions including finance, human resources, customer relationship management, supply chain and procurement. It enables them to streamline processes, drive economies of scale and regain full visibility and control of their business. 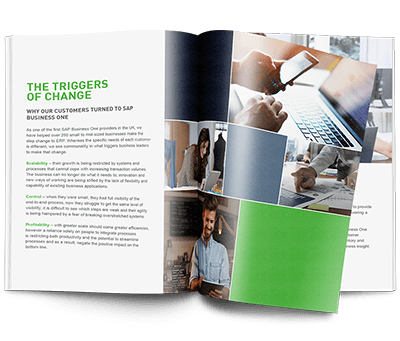 Take a look at our eBook that outlines why Codestone is the right partner for SAP. If you are looking to generate value from the wealth of data you collate, then SAP Business One HANA provides a unique in-memory database solution specifically designed by SAP to deliver advanced analytics. At Codestone we enable our customers to obtain all of the value of SAP Business One without the need to for capital investment or in-house expertise. We do this by offering the leading ERP as a service from the cloud. As specialists in SAP Enterprise Resource Planning Software, we enable our clients to maximise their investment by seamlessly integrating a comprehensive range of ecosystem solutions to meet their specific needs including Orbis TaskCentre, Platypus and BoyumIT. It’s good to know you’ve got a partner you can trust and rely on. Codestone implemented exactly what we needed, and they did it on time and within budget.